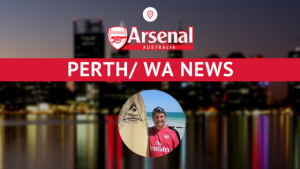 With the worst of the winter behind us and the weather warming up, I just wanted to give you an update of what we have planned for our Perth/WA members this spring. We have match night events at The Game Sports Bar for our games against Chelsea, Swansea, Middlesborough & Sunderland through September & October. The month of November kicks off with a couple of massive games. Sunday 6th November we take on that lot from the lane in the 1st North London derby. Kick off 8pm WA time. After the International break we visit Old Trafford to take on Manchester Utd on Saturday 19th November at 8.30pm WA time. Expect match night specials on food & ale at The Game Sports Bar for these 2 events. Details to follow. Another date for your diary is Saturday 5th November when it’s time to dust off your boots for our next “Arsenal Perth Cup” tournament at Loftus recreation centre. As ever our junior Gunners will be invited to join us. Tournament will be late afternoon/ early evening. Further details to follow. One for the entire family, Sunday 6th November is the date set for our “Family Fun Day”. Venue this year will be Kings Park. As with last year we will have Soccer schools & games for our Junior Gunners & Gold coin donation sausage sizzle for the family. 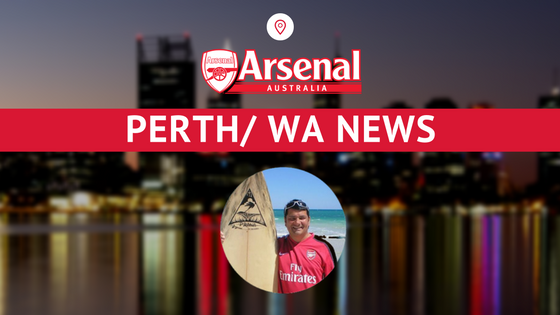 Email: perth@arsenalaustralia.com.au for more details or join the Perth Gooners Facebook Page!